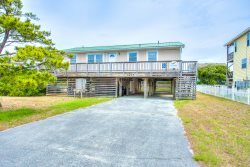 Three reasons why Dolfin's Folly has become a favorite vacation home on Hatteras Island. Unparalleled kiteboarding and watersports location on Hatteras Island. This soundfront home in Avon occupies one of the premier locations on the Outer Banks. Dolfin's Folly is the southern-most soundfront home in Avon and sits adjacent to 4 miles of National Park Service refuge and has unobstructed views of the Pamlico Sound, the Atlantic Ocean and the Cape Hatteras Lighthouse. Dolfin's Folly is at the end of Park Drive and is the rental home closest to the northern boundary of Canadian Hole, one of the most popular watersports destinations in the country. The soundfront setting includes a sandy beach area which is perfect for family groups that enjoy wading in the warm sound waters, fishing and crabbing. The oceanside beach is an easy walk, and there is free parking and off-road beach access just across from Park Drive on the beach road. The private heated pool with a covered picnic area is just one of the many amenities of this incredible waterfront home. Expansive decks line all three living levels. The elevator, a hot tub, screened-in porch, under-house entry and storage, two outdoor showers and a weather station are just a few of the reasons that guests return to this home. Kayaks are also provided for guests of Dolfin's Folly. This spacious 5 bedroom, 5 full bath home features 4 king master bedrooms and one bunk room with an adjacent full bath. The house sleeps no more than 12 guests. Because this is a soundfront home with unobstructed views, the open floor plan kitchen and living area can occupy the middle of three living levels and still have panoramic views that are the best on the beach. No more running ALL the way to the third floor to get to the fully equipped kitchen with two ovens, two dishwashers, a large pantry and miles of countertop. At 4,000 square feet Dolfin's Folly is spacious and open. Windows line the soundfront southwest exposure. The first floor includes a king master, the bunk room and a game room with big screen TV, pool table, second refrigerator and wet bar. The mid level has a king master, and the open floor plan kitchen, dining living area with big-screen TV and stereo system. The top level has two king masters and a large study with a big-screen TV and plenty of comfortable seating. The elevator serves all levels, including the parking level with underhouse parking.